If you’re looking for the perfect jeans to show off your figure, feel comfortable and look fabulous for a special occasion or for everyday look, you should avoid some fatal mistakes that people tend to make when buying a jean. When you go to buy jeans, you should choose a time when you can spend time. To find the right jeans, you should spend at least 45 minutes, and try several different styles and types of jeans so you can succeed in your search. If you’re in a rush, you can not see things clearly, and you will not have time to look at all models. Before buy jeans is not enough to just stand in front of the mirror in the tester. It is advisable to sit and cross your legs to better assess the comfort of the garment and walking around with the jean. If it is too tight to sit or you can not cross legs, it is a clear sign that it is not the right size. If the size looks good on the waist, thighs and quadriceps but it is too long, keep in mind that you can send it to cut. This is very useful if you do not find your right size, even you can check in the same shop if they do not do hems. However, you must make sure it is cut into the right size and well disguise the cut, otherwise not worth it. We all want to look modern and updated, however you should avoid buying a jeans model that does not benefit your figure just because it is fashionable. Note that fashions come and go and the most important thing is to pay attention to your silhouette. First looks for jeans that will benefit your body type and then choose the design that you like within them. 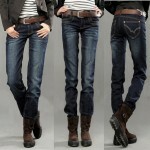 The material is extremely important and must be considered for choosing the jean model that you like. 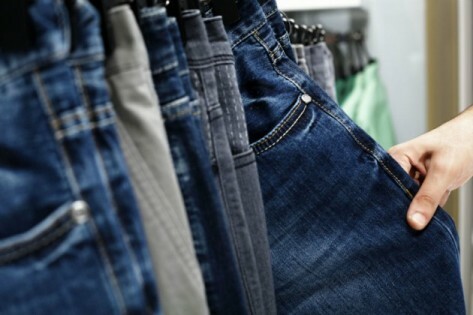 Before shopping, check the materials of your favorite jeans. Take into account the jean materials will prevent you to take surprises and will help you to choose the jean easier. Not all Jeans are similar. There are a variety of designs; more formal jeans and others more casual. If you are looking for just a couple is best to choose a dark color, because it is a more versatile tone that can vary in style and you can use it both day and night. It is best to consider the occasion; if you need one for work, find the model that can be adapted to the occasion and also the clothes that you have to combine. If you want to find the perfect jean you should research before you go shopping, spend time and be clear about what you want, but above all you should avoid making these mistakes! ← What necklines use according to your body?